The evolution of a Canadian earthbag dome house. Israel's blockade of the Gaza Strip has created a shortage of construction materials such as cement. But, some builders have adapted to make use of one thing they have plenty of - sand. Al Jazeera's Bhanu Bhatnaagur reports. Paul in Chiang Dao, a district north of Chiang Mai, Thailand is building an earthbag house with bags filled with rice hulls. Rice hulls are super cheap, fire resistant, superinsulating, and super lightweight and easy to work with. Rice hulls are the by-product of processing rice (the protective coating around the grain), so they’re 100% natural and sustainable. This is the finished roundhouse that was built in 2010 by Owen Geiger and others in Thailand. Video made by João Amorim, edited by Pedro Tarragô about the building process of a sustainable unit - Super Adobe House. Building a Super Adobe "Cloakroom"
This video shows the construction of a cloackroom and a bathroom in EcoOca - Brazil. The techinique was developed by Fernando Pacheco, engineer, and it is called HyperAdobe. 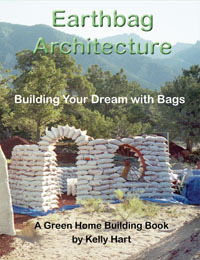 It is the ecological option to the superadobe techinique. A slide show by Nelly Higginbotham which exhibits the art of building a home with earth bags, earth plaster for the exterior and interior walls, and milk paints for the drywall all with an imagination for detail. A four year, artistic project completed by one woman along with the wonderful help of others here and there. Earthbag. Tirelli, Dogon Country, Mali. 2010. This project was produced and lead by Scott Howard. This is the most technical structure completed by Scott to date. A two week-long workshop completed the majority of the structure. The building is almost entirely made of earth. It is a catenary arc, reaching nearly 17 feet in height. Serving as a library for many villages in the area, it is the first earthbag dome in Mali. Slide show of a dome built from earthbags with a quasi-ferrocement roof. Still needs finish stucco and interior plaster. I also plan to pour an adobe floor when the weather is more suitable. This building is basically a "practice building" to gain insight before I build my house. The dome went through a few direction changes while I was building it, but it still turned out to be one extremely strong/massive structure. I'm putting this up for anyone looking for info on this type of construction. I know when I was doing my research, I couldn't get enough of it - so this is my little contribution. The first building on our jungle hillside property. Dimensions are 4 m x 8 m x 2.80 m. Rougly 1100 earthbags and over 50 metric tons of dirt were used to create this fortress-like structure. Duration of actual bagwork, in case you wondered, was 4 persons for 4 weeks. The wooden ceiling serves as a multipurpose platform beautifully overlooking the jungle. This rather luxurious "cave" artfully combines granite, wood and earth. It has a 60 sqm ground floor divided into three rooms on 3 levels, topped by a 15 sqm loft. While the earthbag walls elegantly fill gaps between large boulders, the double roof structure is elliptic in shape and rests on two Sandalwood poles which previously served as main masts on a sailing boat. Corners are entirely absent, and a feeling of peace and tranquility prevails. A small, 3.25 meter interior diameter meditation dome. In order to prevent any light from penetrating the interior, a double door system was devised. Air enters the dome through 3 pipes which run underground for a distance between 4 and 7 meters and is being sucked out by an air vent in the upper part of the dome. This space combines sacred proportions, complete darkness, and only very minimal sound pollution and hence effectively facilitates deeper states of meditative absorption. Built from local materials; Almost wood free; Maximum use of space for minimum use of materials (doing more with less); Self-contained unit; Can be repeated to form a larger home or an eco-village; Can be built by a team of 3-5 people; Designed with the sun, shade and wind for passive cooling and heating; Wind-scoop can be combined with a rated furnace unit; Solar energy and radiant heating may be incorporated. ; Interior furniture can be built-in with same material; Structurally sound and disaster-proof. Our building journey in short video clips. It is 314 sq feet. The walls are covered with papercrete. It has been a long diffcult process. It is nice to finally be living in this home. It is three years of research and work put into four minutes. An Earthbag House from Rob Ormerod... a short video condensing 6 months of building into 2 minutes from the Rhiannon Community in Ecuador. The size of the structure is 20 feet by 12 feet. We dug an 18 inch trench and put gravel till 6 inches. We filled the first two rows of bags with 6% cement. After reaching the height of 18 inches, we reduced the amount of cement to 3%. For the roof we have used bamboo and iron girders. This house took us 17 days to build.